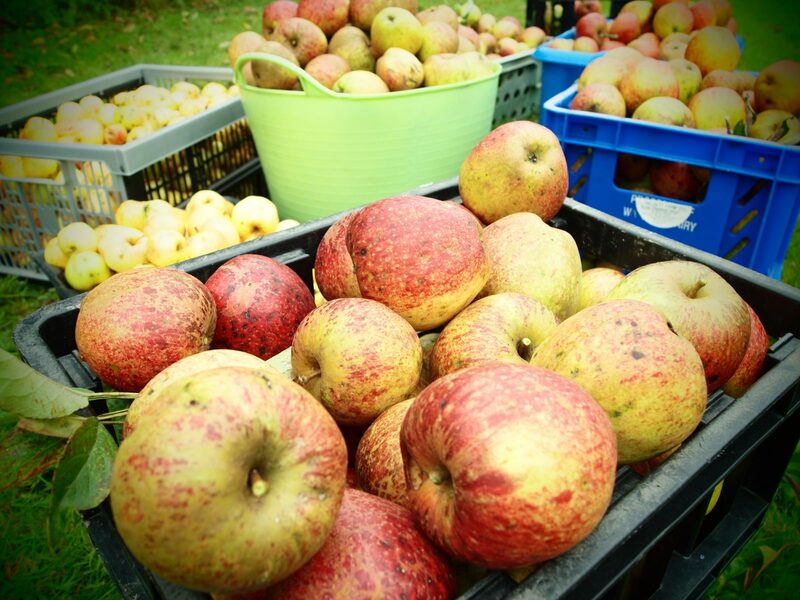 It’s apple harvesting time in north Cornwall! All the veg boxes contain a bag of delicious Lord Hindlip apples from our adopted orchard in St Mabyn. This unusual old English dessert variety can be stored in the bag in a cool place for a couple of weeks or eaten straightaway. We’re looking forward to this Sunday when the rest of our bumper apple harvest will be crushed and pressed at our annual apple juicing fest. You’ll also find a large spaghetti squash in each of this week’s boxes. The name derives from the cooked flesh. This resembles spaghetti when you pull a fork lengthwise through it to separate the strands. Spaghetti squash are a novelty as they’re quite difficult to get hold of in the UK. So be grateful that Jeremy Brown of St Kew Harvest Farm Shop has grown these to go in our boxes of locally-produced food.